In this edition, the discussion will be about how shellac can be used to change the color or tone of wood. Red oak generally has reddish tone to it, and often finished pieces of furniture or millwork will have a slight red or pink tint to them without the addition of any stain or dye. The addition of garnet shellac as a first coat can give the color of the finished piece to a more brown tone, changing the feel of the finished product with realativly little effort. 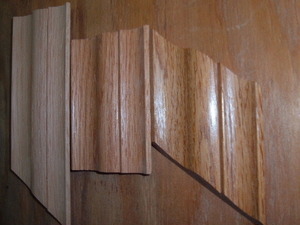 Below is an example of this: the photo shows 3 test pieces – on the left is a bare piece of red oak molding. The piece in the center has a coat of Waterlox wipe-on varnish. The piece on the right has a coat of garnet shellac and a coat of Waterlox over that. Notice the piece in the center with just finish on it has the traditional pinkish tone of red oak, while the piece with the garnet shellac has a warmer brown tone. Shellac can be used to give wood a different feel, while adding less color than using a stain. At the same time you have added a sealer coat that can be top coated with virtually any finish. It should be noted that with lighter colored woods, it may be wise to first apply a coat of a clearer shellac, such as super blonde to avoid imparting the garnet color directly into the light wood and possibly creating streaking. This is the process that French Polishers use: clear, color, and then clear shellac as a top coat.